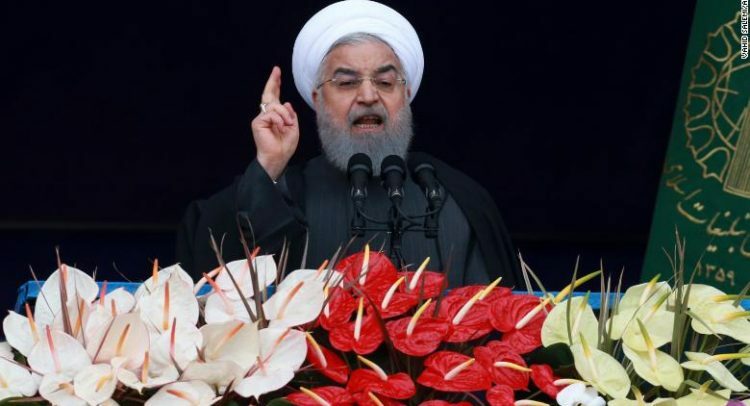 Tehran, Iran (CNN) Iranian President Hassan Rouhani stood before a big crowd celebrating the Islamic Revolution’s 40th anniversary on Monday and vowed to boost his country’s military and ballistic missile program, defying US pressure and sanctions. “Iran will continue to expand its military might and missile program,” Rouhani said in front of tens of thousands of people who had gathered in Tehran’s Azadi (Freedom) Square to mark the 1979 overthrow of Shah Mohammad Reza Pahlavi, a Western-installed monarch, which paved the way to clerical rule. US President Donald Trump has said that the economic sanctions he re-imposed in 2018 sought to keep Iran’s military — namely its ballistic missile program — in check. Tehran has tried to present the anniversary rallies as a show of support for the regime and Rouhani has accused Trump of openly agitating for regime change in Iran. The recital of Quranic verses mixed with revolutionary chants as a sea of people carried Iranian flags and demonstration banners. Stalls that lined the road to the main square distributed information pamphlets, hosted live radio shows and showcased young children singing Islamic and nationalist anthems. “When we say ‘Death to America’ we mean down with Trump, and (US Secretary of State Mike) Pompeo,” said cleric Mohammed Reza Maqsood, 32, referring to the inflammatory chant that has long been a staple of the Islamic Republic’s national celebrations. “I chose to come here and rally so that I can see. I don’t need a higher education to see the support here,” Maqsood added. The chief of the Iranian military’s elite Revolutionary guards was also among the crowds marching to Azadi Square. The government’s messaging centered around the slogan “Yes, we can,” an apparent acknowledgement of the difficulties millions of Iranians face under the strain of renewed US sanctions. Prices have soared, the rial currency has plummeted and food and medical shortages have affected households across Iran. But authorities say that the country is no stranger to hardship, and regularly invoke its people’s “steadfastness” in the eight-year war with Iraq in the 1980s. On Sunday night, fireworks lit up Tehran’s sky and some conservative neighborhoods echoed to calls of Allahu Akbar (God is great). This was a tribute to an oft-recalled scene from the revolution exactly 40 years earlier. On the night before it was declared that the Shah had officially abdicated, Iranians took to their balconies, beating pots and pans as ‘Allahu Akbar’ reverberated across the capital. While many people attest to the fervor that gripped Iranians at the time, several former revolutionaries privately say they feel disillusioned by how the political and economic situation played out. Since the revolution, literacy rates have skyrocketed and access to healthcare and education has improved, particularly in rural areas and the provinces. Yet signs of widening inequality, as well as widespread reports of government corruption and cronyism, have weighed heavily on an economy that has been repeatedly hit by international sanctions over the last 40 years. “There’s been a big push at a grassroots level inside Iran over the past year, as demonstrated by protest movements … to actually deal with issues to do with corruption and mismanagement of domestic affairs,” said Ellie Geranmayeh, Senior Policy Fellow at the European Council on Foreign Relations (ECFR). For some, these problems have marred an event that would otherwise have been cause for celebration. Instead of pitting Iranians against the regime, the Trump administration’s attempts to isolate the country and support anti-regime protesters have only called up images of war, some Iranians said. “My friends and I would rather stick to this regime than have a war like in Syria and Iraq,” said the man. ECFR’s Geranmayeh said that there is a “deep distrust” and doubt about future deals growing once again between Iran and the West. “Will Iran come to the negotiating table once more with the United States? So far, the messaging is no, not until the US comes back to the nuclear deal and meets its commitment,” she added.